You should always strive to install and maintain the best fire alarm system possible. Whenever you own a business, you must always be on the lookout for any possible hazards. One of the biggest concerns for both property managers and business owners is the risk of a fire breaking out. Here is what you have got to know about your fire alarm system to ensure the best chance of fire prevention and safety. You should always strive to install and maintain the best fire alarm system possible. Advances in fire alarm technology have given rise to sensors that can find a fire or predict when a fire is about to break out. Smart fire alarm systems are in your company’s best interests since they can distinguish smoke and dirt from actual causes of alarm, meaning you won’t have to deal with as many false alarms. The system can also identify which alarms need to be repaired or replaced, and best of all, help guide firefighters and other response teams to the site of the fire more quickly so they can put out the fire and rescue anyone trapped by it. Fire alarm systems can work much like the mass notification system your business already has in place. However, there is one major difference – besides alerting everyone in the building, it will automatically contact your local fire department. These systems require cues that anyone can both see and hear are usually equipped with these features. Whenever a fire happens, it is critical that everyone in the building can escape to safety in a timely fashion, since a raging fire spreads every thirty seconds. Every minute increases the risk for everyone who is in the building, so to avoid this situation, be sure to maintain your fire alarm system. One final reason to procure the best possible fire alarm system is to decrease your chances of being fined for potential negligence or noncompliance with mandated safety regulations. 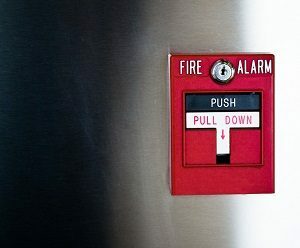 False alarms lead to fines and penalty fees from the fire department, so don’t let that become a regular occurrence that can take a toll on your employees, first responders, and your organization’s reputation. Although they might seem excessive, the purpose of the fines is to ensure that everyone is as safe from fires and fire hazards as possible. This entry was posted on Wednesday, June 6th, 2018 at 8:50 am. Both comments and pings are currently closed.